In the Third Millennium BC a new form of pottery, known to archaeology as a Beaker, began to appear in Britain. Beakers were a continental innovation that spread throughout Europe. The Netherlands may have provided a particular source of inspiration for some of the British Beaker forms (Darvill 1987). A Beaker-dating project conducted by the British Museum established an overall date range of c.2600-1600 BC for these vessels, with most dates concentrated in the period 2250-1750 BC (Jay 1995). It has been suggested that some Beakers occur as early as circa 2800 BC. They are broadly dated in these pages to circa 2500-1700 BC. This period of Prehistory spans the transition between the Neolithic and the Bronze Age and is one of the pivotal points in our ancestor’s story. Metal working was first introduced into Britain at this time. Initially copper was worked, but this was swiftly replaced by bronze - an alloy of copper and tin. The spread of Beaker pottery throughout much of Europe seems to have been intimately associated with the spread of the new copper working technology. In general Beakers were made to a high standard, using local clays. The vessels are frequently thin-walled, intricately decorated and well-fired; distinct in style and quality from the other contemporary Late Neolithic and Early Bronze Age ceramics. Beakers are usually decorated with impressions of cords (mainly on earlier vessels) or the teeth of combs. Comb decoration can form complex geometrical patterns that created vessels of great style and beauty. Coarser Beakers also exist and these may have been domestic pots in 'everyday' use. These vessels were also decorated, sometimes with fingernail impressions ('fingernail-rusticated') or simple incised lines. While the decorative schemes of some Beakers show similarities with others, no two are exactly the same. This is particularly true of the later comb-decorated vessels which seem to intentionally display a distinct individuality. The quality of manufacture and the decorative form of the best Beakers distinguish them as an innovation that would not be bettered in the later Prehistoric periods, or indeed afterwards! Before the advancements in radiocarbon-dating, researchers had attempted to create a typological ‘timetable’ of the various Beaker styles arranging them in order from ‘Early’ to ‘Late’. The results of the British Museum's Beaker-dating project (which included carbon-dating some of the Thanet Beakers) demonstrated that some of these forms have a long life span. There appear to be significant overlaps between the suggested ‘Early’ and ‘Late’ styles. However these labels are still useful in broadly describing Beaker forms. Our best evidence of this period generally comes from burials. 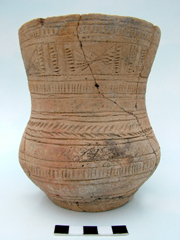 Complete Beaker pots are primarily found in graves and in this context have been seen as indicators of status. The Beaker Period saw a revolution in burial traditions, with the practice of interring quality grave-goods and the widespread adoption of the ‘roundbarrow’. These burial monuments generally focused attention on a single individual, unlike the communal tombs favoured previously in the Neolithic. In the Neolithic the dead were generally buried in large communal monuments such as longbarrows and chambered tombs. Here the bones of an individual were mixed with those of their ancestors; to which they may have been actually or only symbolically related. Prestigious grave-good tributes are rare. Neolithic funery traditions seem to indicate a culture that did not set its citizens apart in death. Beakers are sometimes accompanied by other high-status items which also make a first appearance around this time. These include daggers of copper, bronze and flint; barbed and tanged flint arrowheads; jet buttons and belt-sliders; stone wristguards and battle-axes. The displays of status expressed by Beaker grave-goods show a fundamental change of attitudes in Prehistoric society. They appear to express the elevation and celebration of rich and powerful individuals. The earliest occurrences of Beaker pottery seem to be confined to the periphery of Neolithic society, first appearing at the long abandoned Earlier Neolithic Causewayed Enclosures and in the final ‘blocking deposits’ in chambered tombs. Research by Alasdair Whittle (Darvill 1987) indicates that Early Beaker burials seem to be absent from the vicinity of the Henge monuments, which were the focus of Late Neolithic ceremonial life. However it was not long before Beakers were at the heart of a changing Neolithic society. Their appearance at Britain’s major Henges coincides with a period of renovation and revitalisation of these important ritual monuments. The appearance of this ‘package’ of new objects and traditions was once seen as evidence of a migration of a new people to Britain – ‘the Beaker Folk’. The true story is probably far more complicated. Archaeological developments previously seen as innovations of the 'Beaker Folk', such as roundbarrows and single inhumations, as well as some of the forms of decoration seen on the vessels, have an indigenous ancestry that precedes the Beaker Period. There was no doubt some migration into Britain at this time, but the artefacts probably represent a movement of new ideas, technologies and cultural influences, rather than a large incomming population. Not everyone who is found buried with a Beaker need now be considered as originating on the Continent. 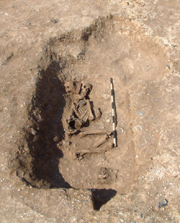 Having said that, the spectacular Beaker burial of the Amesbury Archer (discovered near Stonehenge) does indeed contain the final resting-place of such a person, probably born in central Europe. New techniques used to analyse isotopes of oxygen, absorbed during childhood and preserved in teeth, allow us to broadly locate where some of our ancestors may have been born and where they may have lived and traveled in their lifetime. If such analyses could be applied to the Beaker burials across Britain we would surely discover a lot more about the movement of people and ideas in this important period of our Prehistory. We may even have to revise our revised theories of the Beaker Folk! A close-up view of some of the artefacts recovered from Beaker burials on Thanet. A Gazetter of known and possible Beaker burials on Thanet. An overview of the Beaker heritage of the Isle of Thanet. Pictures of Thanet Beakers with associated radiocarbon-dates presented in descending date order. 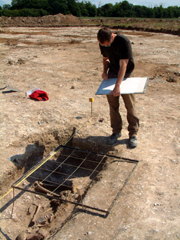 TTA - Trust for Thanet Archaeology. Darvill T. 1987. Prehistoric Britain. Routledge. Jay L. 1995. Thanet Beakers. 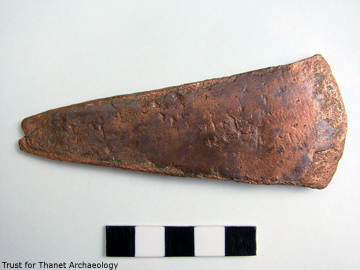 Trust for Thanet Archaeology. The text is the responsibility of the author; the photographs are by the author unless otherwise stated.